Yet those are EXACTLY the places where, I daresay, thyroid health is most vulnerable. Because within your beloved comfort food crackers or favorite restaurant salad dressing lurk the very foods making your thyroid sick. If you already know about your thyroid problem, or if you're already aware that thyroid disease runs in your family, has your doctor discussed diet with you at all? Unfortunately, allopathic and conventional medicine is typically content to throw pills at symptoms — rather than peeling back the layers to treat the heart of the problem. 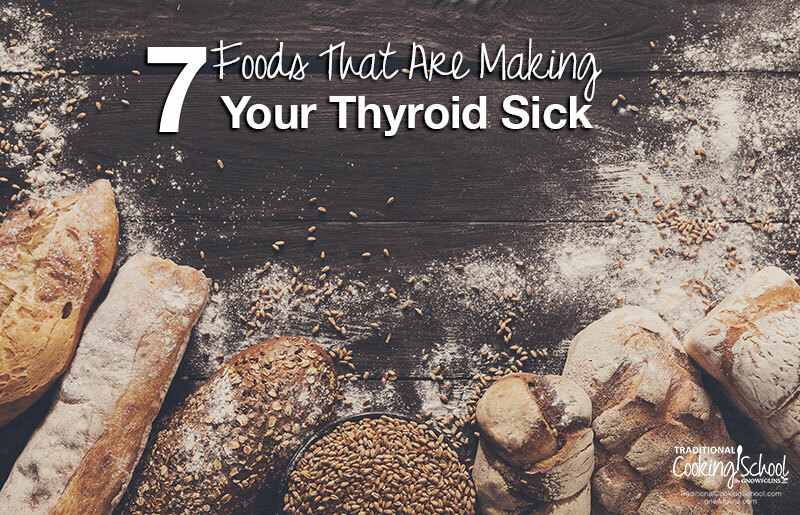 Of these 7 foods that are making your thyroid sick, a few are found on this list as well: 5 Foods That Are Compromising Your Immune System. And it's no wonder! Thyroid disease is almost always autoimmune in nature. Every cell in the body depends on thyroid hormones for regulation of their metabolism. 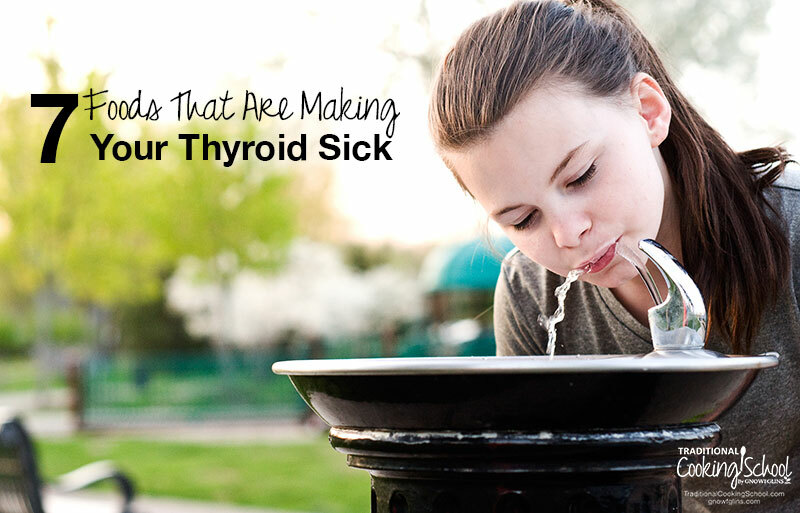 So if your thyroid is sick, your entire body will suffer. Nourishing your thyroid is a wonderful first step; however, you must also avoid the foods that make your thyroid worse. 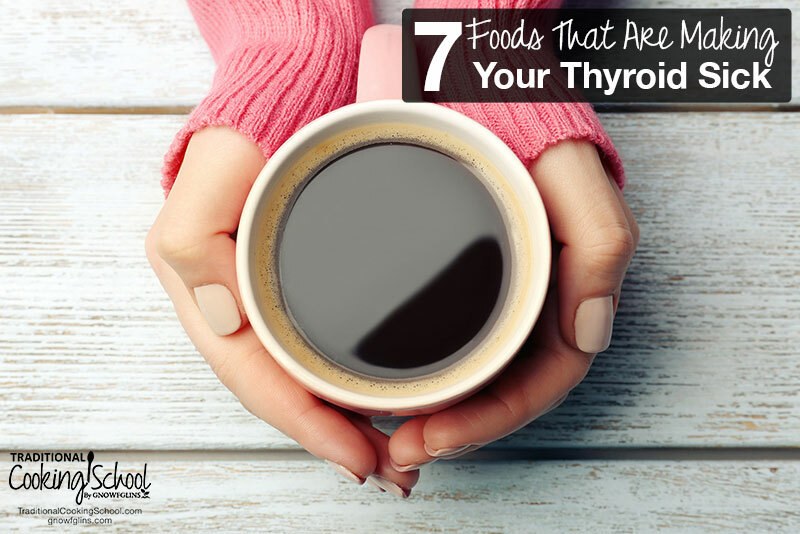 As you add foods that nourish the thyroid into your life, remove these foods too. Years ago, Americans were urged away from tropical oils like coconut and palm oils and encouraged to begin using soy. It was touted as a health food — a perfect protein that could take the place of meat — and caused a rise in unhealthy vegetarian and vegan soy-based diets. As a result, the soy movement began. And as is ever the case, money was behind it. Coconut palm trees simply don't grow easily in the United States, so financial incentives were provided to soybean growers. Soybean oil, texturized vegetable protein, tofu, margarine, shortening, soy milk, and cheap soy sauce flooded the market. Then, much to the demise of thyroids nationwide, saturated fats were demonized. Low-fat/unsaturated fat products and propaganda prevailed for several decades. Is Soy Still Around Today? Absolutely. From restaurant food to breakfast cereal to bottled salad dressings to bread, it's in everything. Look in protein bars, children's snack foods, infant formula, mayonnaise, hummus, and potato chips — it's there too. Perhaps most disgustingly, soy is still proclaimed a healthy protein source. Upon walking into almost any health food store, one can find soy masquerading as chicken, cheese, sausage, and hot dogs. Infants suffer from autoimmune thyroid disorders, leaky gut syndrome, and liver and kidney problems when they eat solely soy-based formula (source). Soy can adversely affect thyroid hormone production as well as interfere with the uptake of synthetic thyroid hormones. Not to mention, almost all soy on the market nowadays is genetically modified, so it's not even good for those with optimum thyroid function. Like sugar, soy hides in places you'd never expect. 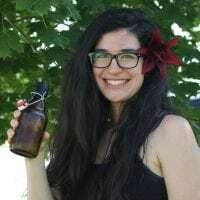 For this reason, we always encourage you to make your own salad dressings and condiments, mayo, and other foods that contain soy when purchased from the store. Action Step: Diligently read labels on every pre-made food you purchase. Place it back on the shelf if it contains soy in any form. Learn how to make your own healthier versions at home to save money and your health. Grains provide the foundation of the modern American diet. Simply refer to the former USDA Food Pyramid and the current and slightly better My Plate, and you'll quickly see that our government promotes a diet heavily comprised of wheat, corn, pasta, bread, rice, and other whole grain products. Hashimoto's is one such autoimmune thyroid condition where gluten, and indeed most grains, are a big no-no. Often, going “gluten-free” isn't enough since so many gluten-free products are still highly refined and because many foods are cross-reactive. The body perceives these cross-reactive foods as it perceives gluten. Even though these foods are gluten-free, their protein structure is so similar to gluten that the body sends antibodies to fight them. Gluten cross-reactive foods include coffee, dairy, milk chocolate, tapioca, soy, hemp, potato, and eggs. These grains are cross-reactive too: corn, oats, millet, sorghum, buckwheat, amaranth, quinoa, teff, and rice (source). All of those foods are technically gluten-free, yet the body reacts to them with an autoimmune response as if they were wheat, rye, spelt, or kamut. Action Step: When giving up gluten doesn't produce a drastic improvement in health, examining cross reactivity and eliminating ALL grains is the next step. In either case, grains should never be the foundation of anyone's diet, especially someone with a thyroid condition. Sources differ on this topic. Many claim the benefits of raw cruciferous vegetables far outweigh the risks they pose to the thyroid. Still others claim the exact opposite — raw crucifers are goitrogenic and should always be cooked prior to consuming. And they should be a part of everyone's diet, in my opinion. Yet they are also goitrogenic in nature. A goitrogen is a substance that interferes with the thyroid's uptake of iodine. When the thyroid isn't uptaking enough iodine, it swells to try to uptake more iodine. This forms a lump in the throat called a goiter. Health practitioners should always palpate your throat area to check for a goiter, which is a sure sign of a thyroid problem. So, Should Cruciferous Vegetables Be Consumed Raw Or Not? I tend to sit in the better-safe-than-sorry camp. Though many trusted sources assure us of their safety, just as many warn against consuming raw crucifers. Cooking deactivates the goitrogenic compounds in much the same way that steaming deactivates the oxalates in raw spinach and kale. These foods still contain copious vitamins and minerals, even after cooking, so I see no reason not to enjoy them cooked on a regular basis. Action Step: Enjoy plenty of vitamin-rich cruciferous vegetables since they contain so many of the essential nutrients needed for proper thyroid function. Just limit raw consumption of them if your practitioner, doctor, or you feel they may cause you to develop a goiter. Can you imagine starting your day without coffee? If you can't, that's a good sign you rely on it for energy. Caffeine dependence is detrimental to your thyroid and adrenal glands. Caffeine actually destabilizes blood sugar and masks your body's signals that it needs rest. Once this cycle begins, it is very difficult to stop. According to researchers, “Caffeine has been shown to markedly alter…thyroid stimulating hormone (TSH), and thyroid hormones in animal studies” (source). Giving up caffeine can be harder than quitting sugar and gluten, combined. Believe it or not, caffeine is actually a drug — a very addictive drug because it stimulates the nervous system, providing a feeling of alertness and energy that might not be there otherwise (source). 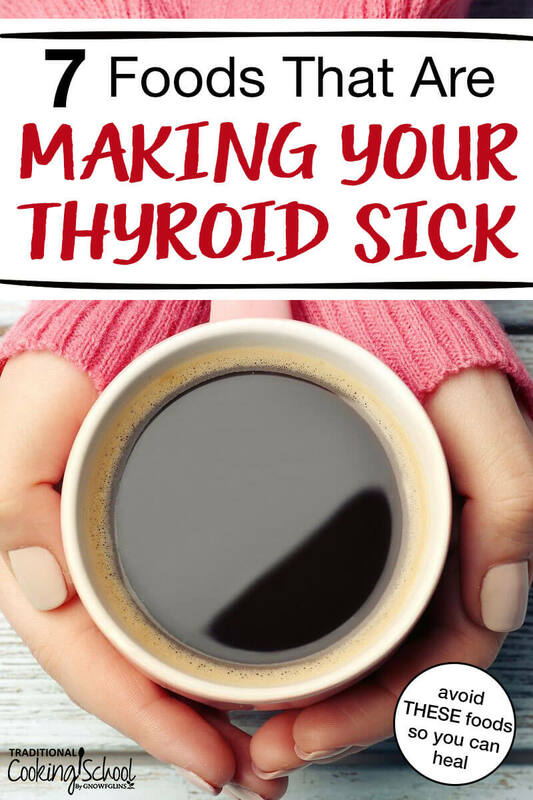 Learning to live without this stimulant will benefit your thyroid's function. Action Step: Quit all caffeine. You can go cold turkey or titrate the amount you consume down over the course of days or weeks. Try these 12 Natural Energy-Boosting Drinks Without Caffeine or (my favorite) DIY Herbal Coffee Substitutes to replace your morning cup. Unstable blood sugar and thyroid problems often go hand-in-hand. To maintain a balanced blood sugar, the thyroid must be healthy. To maintain a healthy thyroid, the blood sugar must be stable. You can't have one without the other. Let Me Clarify: What Does “Sugar” Mean? To make things simple, let me clarify what I mean when I say “sugar”. Because I'm not just talking about white cane sugar — although that's certainly included. Does Quitting Sugar Seem Impossible To You? Quitting sugar, quite frankly, is mandatory if you have an autoimmune disease. Sugar causes leaky gut (often cited as the precursor to autoimmune disease). Sugar inflames and mucks with the entire endocrine system and insulin spikes destroy the thyroid gland. In addition to the damage caused by insulin, a compromised thyroid gland will slow the removal of insulin from the bloodstream. So if you have a thyroid disease and you earnestly want to heal, you MUST give up sugar in all its forms. You must be diligent to read labels in any prepared foods you buy because, truly, sugar is lurking everywhere. If this seems impossible, believe me, I thought it was too. Until I did it. Now I can't imagine sugar as a regular part of my lifestyle when I'm enjoying so many foods and even sweets without it! Here are some posts you may find helpful as you choose to heal naturally. Quitting sugar is a GREAT first step! Action Step: Begin phasing sugar, refined carbs, high-glycemic foods, and processed foods out of your diet. Read labels on any pre-made foods you buy and watch out for sugar in all its forms. Try stevia if you desire something sweet. Fluoride is a major problem in the U.S. because our population is constantly inundated with a continuous supply of this toxic substance. Not only is it added to our drinking water, it's also in our air. It's in our toothpaste, and dentists urge us to get a fluoride treatment every time we sit in the dentist chair. As cited in this Newsweek article, a study compared 2 cities in England. The city of Manchester didn't add fluoride to its water; the city of Birmingham did. The researchers concluded that the doctor's offices in Birmingham were twice as likely to report cases of underactive thyroid (hypothyroidism) than the doctors in Manchester. But those 2 cities weren't the only ones studied. In fact, this study covered 99% of England's general medical practices. “Considering the comprehensiveness of this study—it covered nearly the whole of England—regional differences in fluoride intake or other confounding factors are unlikely to have played a role in the striking results” (source). How Does Fluoride Damage the Thyroid? Iodine attaches to the amino acid tyrosine to then convert into T4 and T3. Fluoride slows this process. Fluoride “switches off” the uptake of active thyroid hormone (T4) into each cell. TSH stimulation by the pituitary gland is impaired because of fluoride causing a reduced output of thyroid hormones. Action Step: Don't drink tap water. Explore various water filtration options and choose one that removes fluoride from drinking water while retaining valuable minerals. Also, invest in shower head filters that remove both chlorine and fluoride from bathing water. Use natural, non-fluoridated dental products and refuse fluoride treatments at the dentist's office. Though the rise in heart disease and obesity correlates with the rise in vegetable oil consumption and decrease in consumption of saturated fats, vegetable oils are still promoted as healthy fats. And people still believe it. Vegetable oils — canola, corn, soybean, cottonseed, sunflower, safflower, and peanut — were non-existent until the 1900s when new technology and government subsidies provided these cheap fat substitutes. Find some “canola seeds.” Oh wait, they don’t exist. Canola oil is actually made from a hybrid version of the rapeseed… most likely genetically modified and heavily treated with pesticides. Heat the rapeseeds at unnaturally high temperatures so that they oxidize and are rancid before you ever buy them. Process with a petroleum solvent to extract the oils. Heat some more and add some acid to remove any nasty wax solids that formed during the first processing. Treat the oil with more chemicals to improve the color. Deodorize the oil to mask the horrific smell from the chemical processing. Of course, if you want to take your vegetable oils one step further, just hydrogenate it until it becomes a solid. Now you have margarine and all its trans-fatty wonder. The healthiest cooking oils and fats are those which are obtained by churning (butter), pressing (olive oil, coconut oil, avocado oil), and rendering (tallow and lard). None of these are chemical extraction processes. They have been used for thousands of years to provide people worldwide with nutrient-dense fats for eating and cooking, and the process for producing them is still largely unchanged. So, Why Are Vegetable Oils So Bad For The Thyroid? They block the thyroid from secreting thyroid hormone. They block the transport of thyroid hormone through the bloodstream to the cells. And, they block the cells from properly utilizing the thyroid hormone that is available. Vegetable oils sustain systemic inflammation. Remember, a sick thyroid is an inflamed thyroid. 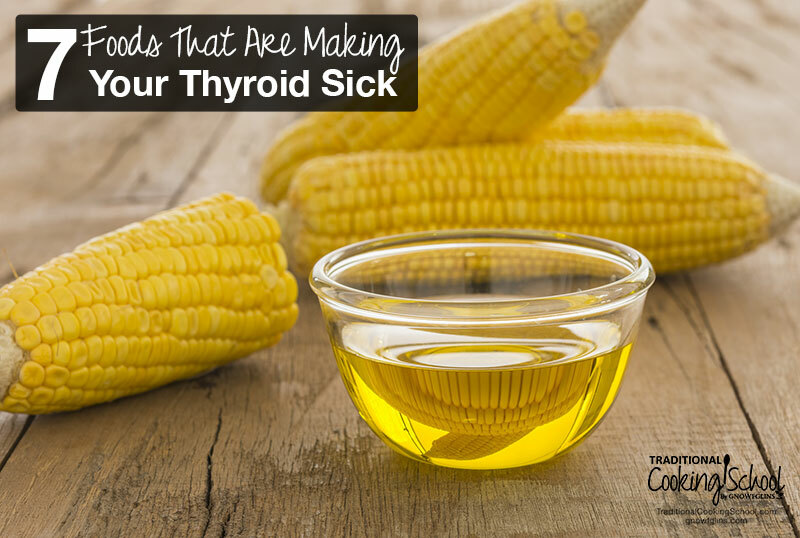 Vegetable oils are genetically modified, and who knows what GMOs are doing to our thyroids?! Action Step: The only way to stop the inflammation and thyroid suppression that vegetable oils cause is to avoid them completely. Choose traditional, nourishing, unprocessed fats: butter, ghee, coconut oil, palm oil, tallow, and lard. As you seek to treat your thyroid holistically, I highly recommend working with a functional medicine practitioner or naturopath to find a diet, supplements, and lifestyle that work for YOU. There is no one-size-fits-all approach to any disease. Yet it is so interesting that the very foods that nourish the thyroid are some of the same nutrient-dense foods we talk about all the time at Traditional Cooking School. 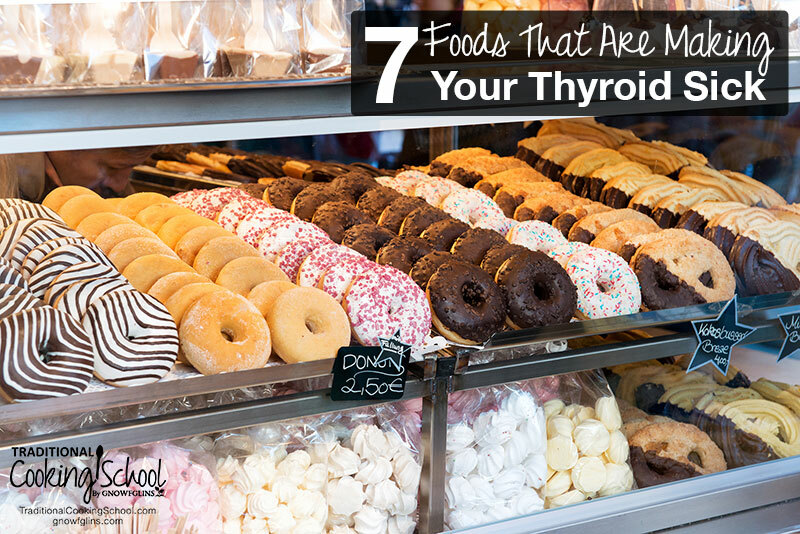 And the same foods that weaken your immune system are weakening your thyroid as well. Please feel free to share this infographic image on Facebook, Pinterest, or Twitter! Hover over the image and easy share buttons will appear! Are you dealing with hypothyroidism, hyperthyroidism, Hashimoto's, or other thyroid disease? How is nutrition playing a role in your life? 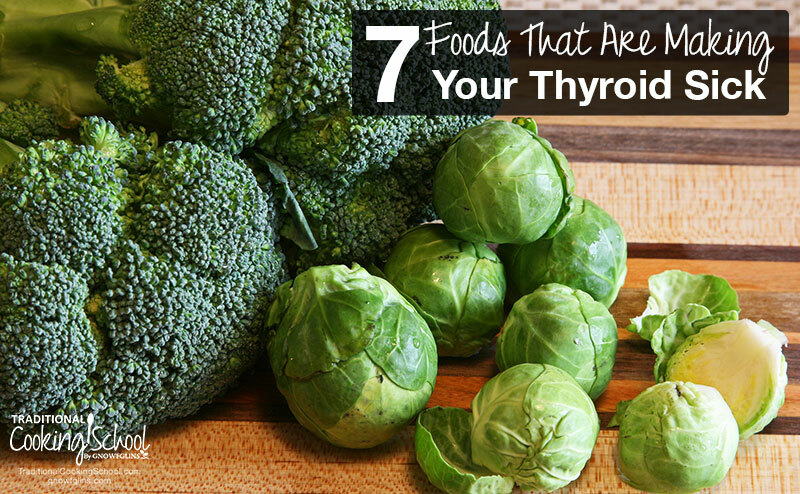 Also see: 7 Foods That Nourish Your Thyroid. Gluten is as addictive as street drug opioids as it affects the same brain receptors. Sugar also satisfies our brain’s reward centers in an addictive fashion. Caffeine is just another drug we use as food. The page “foods that feed your thyroid” was not accessible. Can u help me find it? I am always amazed at the way food can disrupt our health or restore it. I have autoimmune disorders and I’m always paying attention to what irritates and what makes me feel well. Great post! You’re so right, Brenda! Glad you enjoyed this post! Thanks so much for this post, it’s so informational! I get immediate chest pain that I suspect is angina whenever i ingest them alone (non heated) or with healthy foods and meals. I even have this issue with avocado and olive oil and fatty foods like salmon and almonds and they don’t have to be large amounts. I do not have this reaction with canola oil which is why I stick with it. I want to do what’s right for my body but I’ve also learned over time that’s it’s very important to listen to my body. Despite that, I’m still not sure what is more or less risky for my health in the long term. Any advice why this may be happening and what I should do? Thanks for any help! So…what’s left to eat? I don’t do well with beans at all. No coffee, no sugar, no grains, no dairy, no foods that react as if they’re gluten, nothing with chemicals or gmo. Seriously, what’s left other than a limited amount of vegetables? Hi there! Since poultry is soy-based fed, is there any possibility that eating chicken breast or a lot of eggs can make a thyroid sick? I which way can soy components ‘travel’ in the chicken meat or eggs? Forgive my bad English! I hope you understand the question. Congrats for your blog, It has very good data! hi there…soy being goitrogenic so even a vitamin e with soybean oil being the 2nd or 3rd item in it could cause harm to the gland? or a phosphatidylcholine capsule i have been taking with soybean oil to? and because it is in supp form would be even worst? could you also please email me with an answer just the same? 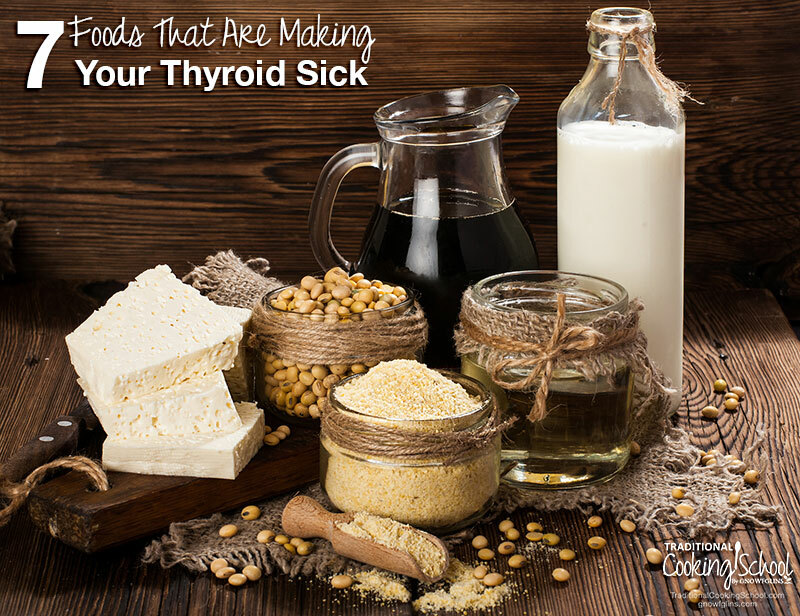 Hi Lindsey, love your write up on the 7 foods that are making your Thyroid sick. All the vegetables that you had mentioned I liked them but don’t eat them . But I thought kale is good for juicing and I had taken it twice. So I have a question now, ghee,butter and such as recommended by you. I love butter in daily cooking,and I am suffering from thyroid . My doctor adviced me that it’s good to consume what I fancy, which I am careful and watch what I ate. After reading your articles I have many questions. I had dine My biopsy test and regularly done my follow up . My doctor advice I don’t need pills or supplement to reduced the goiters. The only cure is to undego operation. I have low thyroid I’m on a pill for it . I’m trying to learn what to eat but I also have ibs and I can’t do diary . I’m on a budge with 1 income . What foods can Ihave get that is healthy but cheap. Forefront health regularly recommends coffee with milk, sugar & tiny amount coconut oil! I drink one daily plus several normal percolated coffees. Helps & doesnt hinder. I was wondering where your citations are for this article? Or did I miss it?